I have been remiss in posting to this blog, sorry. We moved in February and I'm just now getting my groove back. With Easter only a couple days away, I thought I'd share something springy. And can you believe it? I actually got a decent photo of my food! Let me say, Pinterest is a major motivator to get your food to actually look good so people will want to eat it, lol. And speaking of Pinterest, that is where I got the idea for this recipe. Blackberries were on sale and I bought 3 packages, not knowing what I'd do with them. 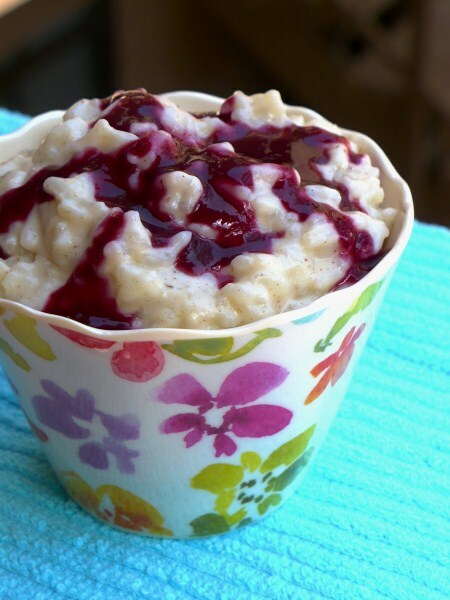 I did a search for "blackberry" and came across an intriguing recipe from Spoons 'n' Spades that involved rice pudding with caramel and blackberry sauce. I liked the idea, but wasn't so sure about the caramel part. It got me thinking. So I searched for a good rice pudding recipe (I wanted something creamy and rich) and found one on Food.com that sounded right. I made a few changes, of course, because I can never leave well enough alone. Another search for blackberry sauce led me to Smitten Kitchen, whose recipe I have, again, adapted (very slightly). This recipe is designed to be served warm. 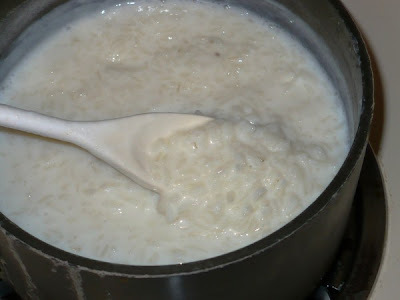 If you wish to serve it cold, just understand that the rice will continue to soak up liquid as it cools and the pudding will get really thick. This can be fixed, however, by stirring in more milk or half-and-half to reach the desired consistency just before serving. The blackberry sauce is great warm or cold. You will no doubt have left over sauce, but it's great on ice cream, pancakes, in smoothies, etc. Or you can freeze it until next time. Meanwhile, beat egg with half-and-half. Slowly stir into rice with raisins and cook 2 minutes more, stirring constantly. Remove from heat, and stir in butter, vanilla, and cinnamon. Let cool slightly and serve warm. While rice is cooking: combine all ingredients in a blender and pulse until smooth. Pour through a fine mesh strainer into a small saucepan (if you don't want seeds). Scraping with a rubber spatula will help force the pulp and juice through. Heat sauce over medium heat until it boils, stirring occasionally. Reduce heat and let simmer 5 minutes. Remove from heat and let cool until ready to use. Can be kept in refrigerator for up to 1 week. *if using frozen blackberries, reduce water to 2 Tbsp.